Editor’s note: This post comes from 2-time guest poster Barry Cantin and it goes out to all my Baton rouge homies. and the race scene in Grease). I never gave it much thought when I lived up there in BR. but noticed that it just DISAPPEARED at some point downtown. Strangely enough, it seemed to disappear underneath someone’s HOUSE. 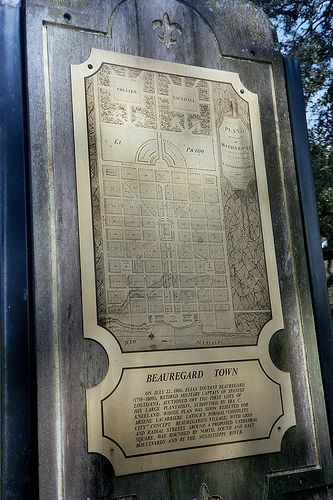 The tunnel appears to be under the trendy Beauregard Town neighborhood. There’s a bunch of old maps I found on the web, but I can’t really decipher them without taking a closer look. Apparently, it IS possible to explore this tunnel. BR, I’m talking to you. Editor’s note: And if you’re in the downtown Baton Rouge area, check out this freaking quarter-pipe wall in front of Chase Towers. They’re always chasing kids with skateboards and bikes away from it, but why would they design something like this if they didn’t want to invite people to use it as a ramp? where’d you find that old red brick? i’ve been searching for forever! I went there a few days ago. Quite an experience. There are three tunnels down there, the one on the right comes to an abrupt end. Certainly didn’t go on for miles. Ten minutes of walking. Simi, where are you entering? Simi, look at the street-view picture on the top of this page. We went that direction along the concrete platforms shown. We walked on the platform to the left, the one in the picture with the white graffiti. From there we walked and walked and eventually found an overhang, and to the left were three separate tunnel entrances. We took the one on the far right to no avail. Is that where y’all entered? 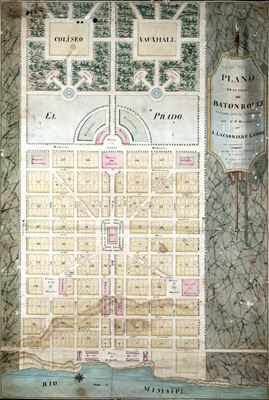 Hello I have found this post in doing some research on underground tunnels in New Orleans for a fiction book I am writing. 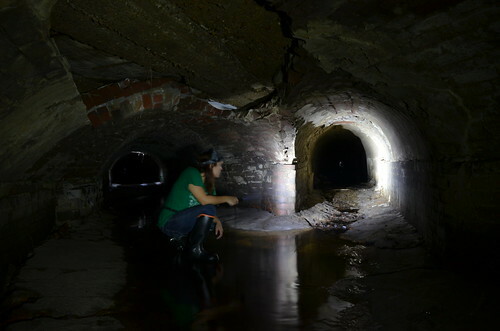 Was wondering if you knew of any tunnels similar to these located in New Orleans? Thank you. 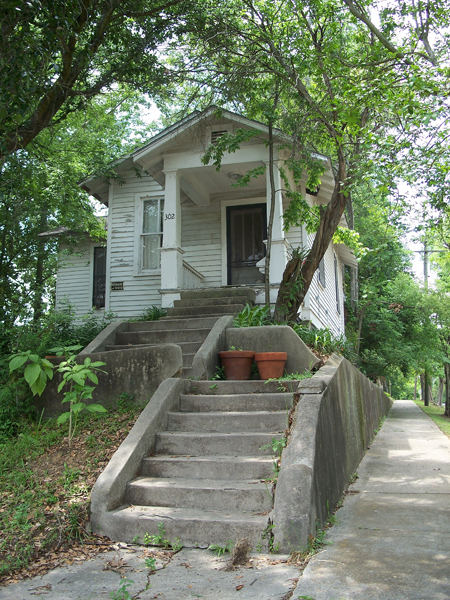 See my post on New Orleans Underground Bomb Shelter. Bayou Duplantier reappears south of LSU campus — it goes from downtown underground to the LSU lakes, then re-emerges behind College Town and University Acres and continues as Bayou Duplantier on the east side of HIghland Road, re-emerging under the little bridge near Lee High (on Lee Dr.) and near the Place Du Plantier apartments. 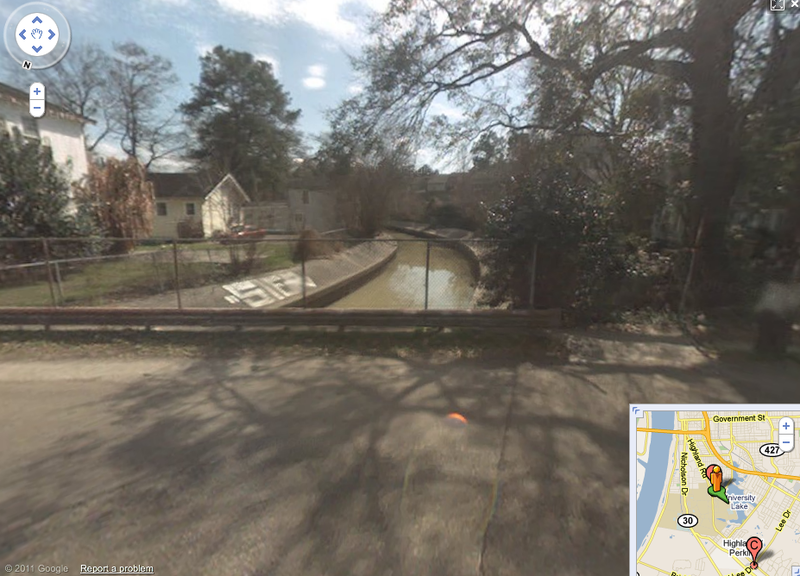 The Bayou near Cane’s and Winn-Dixie, on the west, lower side of HIghland, is Bayou Fountain, and it winds its way erratically along the length of Highland Road, partially culverted in some places. The Bayou that roughly runs across College near Lee and meanders back and forth along Perkins Road, culverted in many places, is Dawson Creek. I think Dez is right: I live on Bayou Duplantier, and it is basically the overflow from University Lake. It flows behind the Crescent Apartments and is a big lake between the Stanford Place and Plantation Trace subdivisions. It flows due east and merges with Dawson Creek just west of Kenilworth. Are the tunnels downtown the same secret tunnels that the governor use to use to go from the Old State Capitol to the Hilton downtown??? Ive been down there, a waiter from the Hilton took me and my wife and a couple of our friends down there after a Christmas party. Allyson took Pics, I will see if I can find them and post them. Huey P. Long Had the Tunnel built. There is a Brick room down there were they Gambled and the tunnel goes across the street from the Hilton to The Indigo hotel. Back then I think it was a office building. Wasn’t there tunnels under the Rivergate going along the river or something? The tunnel under the Hilton Hotel to the Indigo hotel was there when the Hilton was the Heidelberg Hotel to the King Hotel across the street, both hotels owned by the Albert Pick Hotel hotel corporation. My Dad was Purchasing Agent for both hotels back in the 1950’s. He took me through that tunnel many times back in the day. There was a big room in the Heidelberg Hotel that was where Huey Long met with his cronies. Of course, he had some way to get out without being seen so I’m sure he must have used that tunnel under the street to the King Hotel. Would love to know where else it went from the hotels. The Indigo Hotel and the Hilton Hotel were originally built and owned by the Albert Pick Hotel Corporation. The Hilton Hotel was originally the Heidelberg and the Indigo was the King hotel. Back in the 50’s my Dad was Purchasing Agent for both hotels. He took me through that underground tunnel many times when I was in high school at BR Magnet High School. There was a room in the Heidelberg that was known as the Kingfish’s room. Many deals and gambling took place there also. The Hilton owners have turned it into a private meeting room which I also saw when my son in law was GM of the hotel. Interesting, Joyce! From about 1946 to 1954 my dad was Controller for both hotels (King & Heidelberg and also the old Istruma, which they mostly didn’t claim). The manager’s daughter, Mary Ann, and I kept our scooters down in the tunnel when we were young and played there a lot.As my brother grew up he joined in. At that time it was also a dry way to get to dinner at the Heidelberg from the King where we lived. Because of my dad’s position, all our meals were complimented, as well as our apartment at the King, 5th floor! At that time, the maintenance/boiler room were down in the tunnel, and the laundry room across from it. Sometimes one of us would get in a laundry cart and the other would push, fast! We had a few near misses with maids & other employees. Thinking back, Eloise had nothing on me.I attended Nicholson Elem. and then Baton Rouge Jr. High. In 54 or 55 we were transferred to Detroit, then Chicago where my dad was Controller for Albert Pick Corp for many years. Either you came after I did, or you didn’t actually live in the hotels? I attended Nicholson School in the mid-50’s and stayed overnight with the Heidelburg manager’s son David Stafford and had much the same run of the property and played in the now famous tunnel. Is there any knowledge of how to contact David Stafford? David is my ‘lil brother. He’s alive & well in Louisville living with our father who is now 102.
p.s. Dad was not the manager, but the controller. David’s worst escapade at the Heidelberg was while Mary Ann & I were playing in the tiptop ballroom one day, sweet little David amused himself by dropping bottle caps he’d found thru the grated balcony overhanging the front of the hotel, and they were bouncing off of parked cars down below. The doorman sent a bellboy upstairs to stop this action posthaste. I don’t remember any repercussions because all the employees knew and tolerated us. When we weren’t in the tunnel we were usually in the big ballroom at the top of the Heidelberg or one of the smaller ones on the mezzanine. Luv those hotels. Certainly did not realize how unique they were as a child. Just took the tunnel for granted as a playground and transportation back & forth between the hotels.